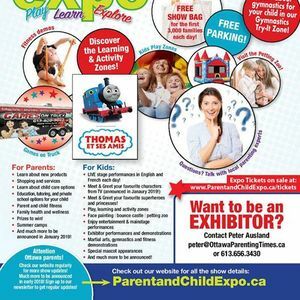 The Ottawa Parent & Child Expo is the Capital Region’s largest & longest running bi-annual bilingual parent & kids expo, and the only #LOCAL parenting show with over 125 exhibitors for families to discover! The Ottawa Parent & Child Expo features more professional performers, interactive play zones and over 125 exciting parenting exhibitors. So much to see and do for young Ottawa-area families – and the best part - it’s affordable! With a valued-priced family-pass and free parking at the family-friend Nepean Sportsplex, families can play, learn, and explore much more! Ottawa's Biggest & Best parenting show and kid's expo takes place April 13 & 14, 2019 at the Nepean Sportsplex. Families can see main stage entertainment, visit local exhibitors, learn about education options, French Immersion, child care, summer camps, family health and wellness, meet & greet characters and mascots, visit the petting zoo and so much more. Check back weekly as we update more and more information about the April 2019 Ottawa Parent & Child Expo at the Nepean Sportsplex. Free Parking!